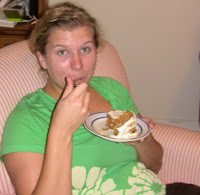 First of all, a little trip down memory lane to my first experience with carrot cake. I very vaguely remember a little girl named "Candrianne" (spelling? who knows - this was way pre-literacy in my life). She had a birthday party, at which I remember eating a cake I really liked. For some reason it stuck in my head as something called "carrot cake." I think I was about 4 - definitely pre-kindergarden. 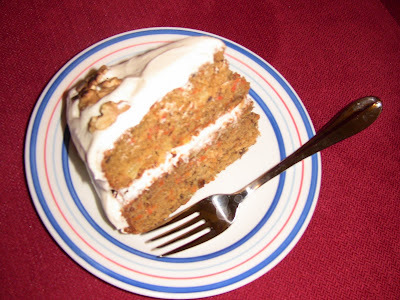 So when my mom asked me what kind of cake I wanted for my birthday that year, I said that I wanted carrot cake. 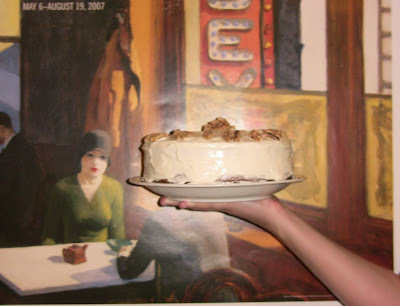 My mom made what I'm sure (retrospectively) was a delicious cake. I took a big bite, and I HATED it! So my first carrot cake was a pretty bad experience. Luckily I recovered. 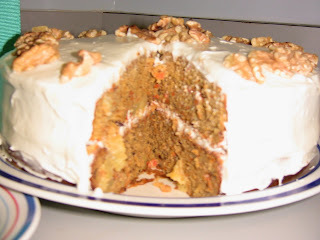 Now I rank carrot cake in my top cake favorites. That's right, when I'm in the mood, it may rival chocolate cake (woah, bold statement, I know). 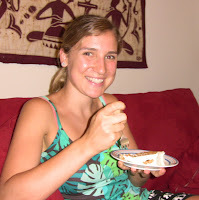 On Saturday night, pre-long run, my friend Mer came over to bake carrot cake with me. 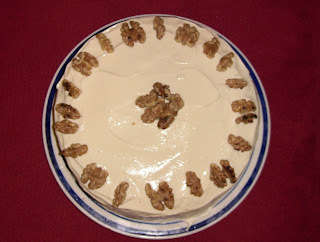 When I say "we" made carrot cake, I mean mostly me. I'll be honest, I do not like baking with other people. I just don't understand how it works as a group activity! Mer did some prep-work, and she took care of the frosting. But it's just better for everyone involved if she talks to me while I measure/stir/mix/pour the cake batter (or vice-versa, I'm fine with being the one on the sidelines). I'm a control freak. I know it. That's just how it is. We used Mer's recipe, which is originally for cupcakes. So you should double it to make a whole layer cake (because more layers = more cake = more frosting = yum!). We didn't realize this at first, so I ended up making one layer, and then the other. This was actually a good thing, because I learned that the 1 egg + 1 egg white is an unnecessary waste of an egg - I made the first layer like that, but the second one I just cracked one egg and it turned out exactly the same. Also, I accidentally bought cubed pineapple instead of crushed. So we diced it, which was ok, and resulted in some yummy chunks in the cake. 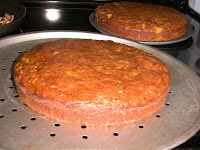 But overall, the cake ended up more pineapple-y than a normal carrot cake because a lot of the juice got in as well. Flavor-wise it was kind of a tropical carrot cake - it tasted more like prune-pineapple cake than traditonal carrot cake (which is not necessarily a bad thing). And the pureed prunes made it amazingly moist! The frosting was the easiest frosting I have ever made - marshmallow fluff + cream cheese. That's it. No worrying about how melty the butter is, or if I added too much powdered sugar. According to Mer, Trader Joe's cream cheese comes out lumpy, so it's better to stick with Philadelphia. Also, we doubled the recipe. In the future, I would probably triple it to make enough frosting to do a 3 or 4-layer cake! frosting it. It can be hard to be that patient, I know - especially when it's 10pm and you have a 13-miler in the morning - but TRUST ME, it's worth it. 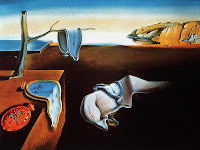 This is coming from a girl who has cried over too many cakes that end up looking like a Salvadore Dali Melting Clock. To make cupcakes: Preheat oven to 325°F. Line 12 muffin cups with paper liners or coat with cooking spray. Combine prunes with hot water in a food processor and process until smooth; set aside. Drain pineapple in a strainer set over a small bowl, pressing firmly to extract most of the juice. Set the pineapple aside and reserve the juice for another use. Whisk flour, cinnamon, baking powder, baking soda and salt in a bowl. Whisk egg, egg white, sugar, oil and the reserved prune puree in a mixing bowl. Add the dry ingredients to the egg mixture and stir with a rubber spatula until blended. Stir in carrots and the reserved pineapple. 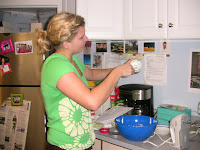 Divide the batter among the prepared muffin cups, filling them about two-thirds full. Bake the cupcakes until they spring back when lightly pressed in the center, 25 to 30 minutes. Let the cupcakes sit in the pan for about 2 minutes, then transfer to a wire rack to cool before frosting. To make cream-cheese frosting: Beat cream cheese, marshmallow creme and lemon juice in a bowl with an electric mixer until smooth and creamy. Spread each cupcake with frosting and sprinkle with pecans (if using). Sleeping and Running - WHY Won't They Mix?? ?